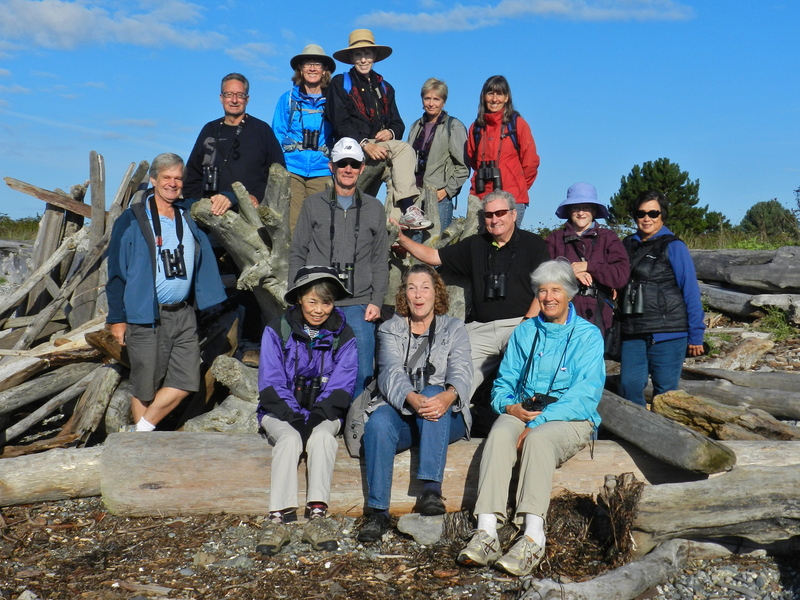 On Wednesday September 18, thirteen Delta Naturalists traveled to Point Roberts to hopefully, do some serious birding. Eleven of us, Terry, Kirsten, Anne, Tom, Sheila, Jean, Marypat, Marion, Bill, Kay, and Donna, met at Petra’s about 7:30 am and from there we carpooled to Point Roberts, crossing the border, without incident, and meeting Ken and Anne on the American side, close to Lighthouse Park, our first stop. As we were busy identifying Horned and Rednecked Grebes, a Belted Kingfisher, Great Blue Heron, White Winged Scoters, Pelagic and Double Crested Cormorants, Bonaparte’s and Glaucous-winged Gulls, and a Common and a Pacific Loon, we were invited to assist a kayaker in taking his kayak off his car and down to the water. We later learned that this man had just paddled from Alaska down the inside passage and was now on his way across to Vancouver Island and then around the southern tip and up the outside coast of the Island. What fun to meet up with such an adventurer and to witness his single-minded preparations for his trip. Back to birding. We proceeded to slowly walk south along the beach and stopped for quite a while near the southwest ‘corner’ of the point, still in Lighthouse Park. Tom’s remark that we could just stay put and let all the birds come to us seemed to pan out, as the longer we stood there the more we saw, including Harbour Porpoises, Steller Sea Lions, Harbour Seals as well as many more birds! Birds included, more male and female Harlequin Ducks, a Red-Necked Grebe, a Horned Grebe, Surf Scoters and a Peregrine Falcon. Also, close to us, at the water’s edge were 3 Black Turnstones, and a flock of Sanderling and Western Sandpipers. As we walked along the southern coast of Lighthouse Park, the sun started to come through the clouds warming the air, and we saw a flock of Cedar Waxwings, a few Savannah Sparrows, and some fabulous sightings of Steller Sea Lions leaping partially out of the water and wrestling with fish. As we moved away from the water, and ventured inland we saw many American Robins, heard and saw a few Bewick’s Wrens, Song and White-crowned Sparrows, American Goldfinches, Black-capped and Chestnut-backed Chickadees, Northern Flicker, Yellow-rumped Warblers, Common Yellowthroat, Anna’s Humming birds, Barn Swallows, House Finches , a Merlin and European Starlings. Having exhausted our finds, we piled back into the cars and headed for Lily Point on the Southeast side of Point Roberts. From two lookouts above Lily Point we were able to identify Western Grebes, Common Loons, Marbled Murrelets, a Heron, and possibly Alcids such as Pigeon Guillemots and Rhinoceros Auklets. Some birds of the Kinglet species were also seen. Other than Jean having lost the handle to her scope (she says she can get another), I’d say it was a very successful outing. Thanks to Tom for getting us all out for another great birding morning. Check out photos by Terry Carr and others on our DNCB Picasa link. We will leave a couple of shuttle cars at Campground parking lot, move en masse to Heritage Area Parking lot at start of Houston Trail loop, and (weather permitting) return to Campground via Edge Farm Trail, by the Fraser River. – maybe reschedule to Monday, Oct. 7? This entry was posted in *DNCB, Black Turnstone, Bonaparte's Gull, Common Murre, Harbour Porpoise, Harbour Seal, Harlequin Duck, Lighthouse Marine Park, Lily Point Park, Merlin, Peregrine Falcon, Pigeon Guillemot, Rhinoceros Auklet, Steller Sea Lion. Bookmark the permalink.